I'm pleased to join you all on this new site! 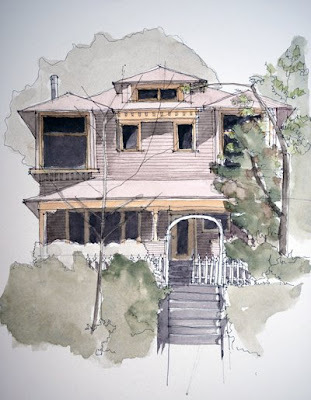 With our recent warm weather I've been enjoying walks around Capitol Hill and decided to draw one of my favorite old houses on Bellevue Ave.
what a lovely rendering! You've really captured the strong sunlight and cool leafy shadow with subtle colors. I love the fence's attitude too! awesome sketch Joanna! welcome to the party! you have great stuff to draw around Capitol Hill, i'm jealous! Thanks Beth & Gabi! It's easy to take the old buildings and funky atmosphere around here for granted...sketching helps me appreciate it. Wow. Nice feel- comfy, warm, quiet. Makes me want to sit on the porch and drink a glass of lemonade. Funny about the lemonade -- Frances and I are planning to find this house and bring ice tea.